African dwarf frogs are small little aquatic frogs that can mix with tropical fish. The dwarf frogs only grow up to 2-3 cm / 2 inches fully grown. They live in water parameters of Ph range 7.0-7.6, temperatures of 24-26 celcius / 75-79 °F. The dwarf frogs as the stay so small are best to go with smaller community fish as they are not aggressive at all. They are an aquatic frog so they do not live out of water, however they do need to pop up to the surface of the water to take a breath of air but that is only every now and then. The dwarf frogs are a bottom feeding frog so they will eat any food that falls to the bottom of the tank. You can feed them on mini granular food, or cat fish pellets. They do need frozen or live bloodworm as they do like a little bit of meat in there diet. 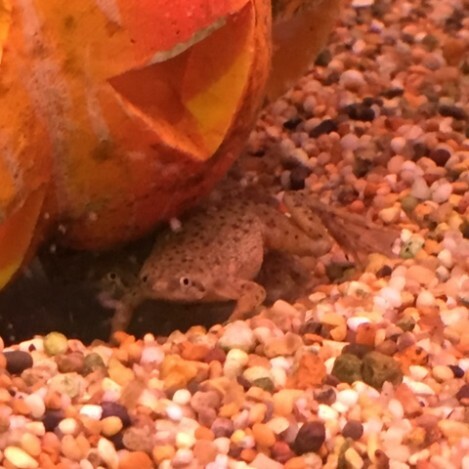 Dwarf frogs are bottom feeders. Feeding them sinking food is best. They are only small frogs so really they only require small size food. They do like live or frozen foods in there diet.